The Relay Wild Triathlon/Fun Run, is an ITU relay format triathlon race, organised by Perth Triathlon Club. The race is returning for a seventh year because we love organising this race! Footage from the 2018 event here. RACE DATE: Sunday 11th August 2019 - registration 10am. We have space for 50 teams of 4 people, so a limit of 200 participants. This is a very popular event and has sold out each year so be quick! Each person in the team will in turn complete a short triathlon course, and then tag their next team member until all four have completed the course. The distances are 200m pool swim, 5.8km on road cycle and 1.2km run in the grounds of Kilgraston. 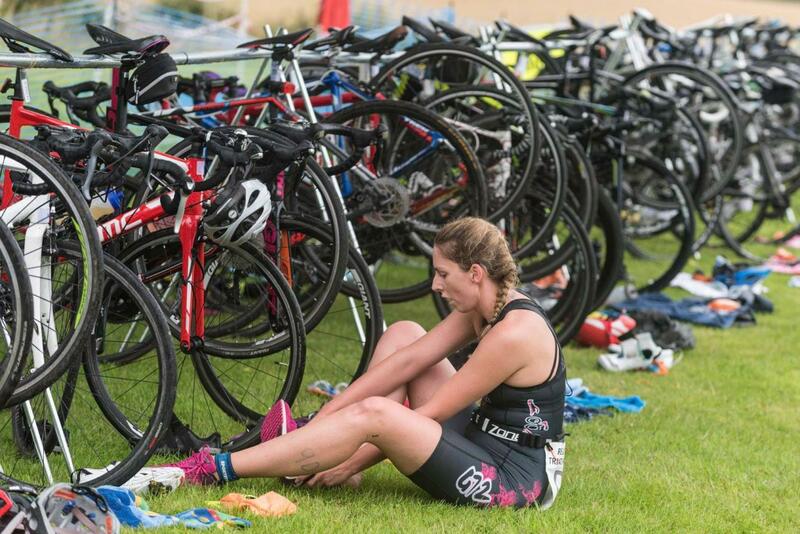 Each person will swim-bike-run before the next person starts and so is a great event for spectating. Team categories are 4 x male / 4 x female / 2 x male + 2 x female (must run in order female-male-female-male). No other combinations are eligible to enter so please make sure you enter names correctly. Prizes will be awarded to the overall winners of each of our three categories. Extra prizes are first local team, fastest swim / bike / run splits and a NEW prize - for the A team member, a prize for the most accurate predicted swim time versus actual swim time. Entrants must be aged 17 by 31st December 2019. Anyone who is under 18 years old will need a signed parental consent form in order to take part on the day. So that the event is family friendly, we will also have a free kids fun run before the main event - you can register children for the fun run on Entry Central too. The run will be around the triathlon run course, and children are encouraged to dress up as their favourite wild animal. Children can be accompanied by a parent, and everyone will receive a wee sweetie for their efforts, even the adults! The school grounds are fantastic and there is even a small adventure play area next to the finish line. There will also be a post event buffet. The race is chip timed by Results Base. We anticipate the schedule to be as follows, but is subject to change to later in the day. Normal British Triathlon rules apply and there will be a technical official present on race day. Teams which include someone who is a member of Triathlon Scotland are £80 (£20 each) and teams who do not have someone who is a member of Triathlon Scotland are £85 (£20 each with a £5 non-member additional charge). We try to keep the entry fee as low as possible and so this is a 'no-frills' event, but we do have a competitor give away and a free post race buffet. Remember in addition to our usual prizes, this year there will be a special prize for the team whose A member provides the most accurate swim time. IMPORTANT - if one of your relay team is a member of Triathlon Scotland, please input their name as team member 1 so that your entry discount can be applied. If you do not know all the names of your team yet, then just leave the details blank and tell us when you do know. You MUST however know the name of your first swimmer as the start swim times will be based on that person. Also, in the mixed team event, you will start female - male - female - male. Clubs are encouraged to get involved and enter as many teams as you like until we are full. We also invite people who are new to triathlon to give this race a go because the distances are very short. Please tell your friends! If not, take a walk on the wild side and sign up for the Relay Wild Tri! Refunds: At the organiser's discretion, 50% refunds (minus credit card processing fees) will be issued to any competitor who withdraws from the event more than 21 days before the event (21st July). Withdrawals after that date will be refunded if, and only if the competitors place can be filled from a waiting list. No Refunds will be issued after the event closing date (Friday 28 July).